If you've been keeping tabs on my Minion Adoption Project, then you would know that there's one LAST adoption phase. After giving a sneak peek to all my AiMail subscribers 2 weeks ago, I can finally reveal it all to you guys now. The 50 limited miniature minions have already been sent out to their respective new owners. But due to the many customisation features of the minions and some mix-up (whoops), it turns out I have a few more little fellows for adoption! They are just as adorable as the rest of the crew, and would make lovely Christmas presents! From the picture you can also tell who is made into a charm (with the metal loop), and who is decorative. The adoption cost is at SGD59/piece for all of them except Chester, Daniel and Gregory who are SGD69/piece. I am offering free worldwide shipping (registered mail) for the minions as well. I have lined them up for a photo so that you will get exactly what you see, and I've given them names too! 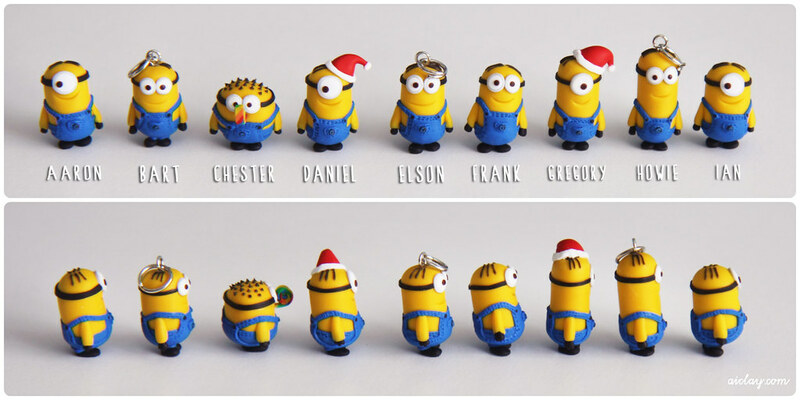 Email me at buzz@aiclay.com and let me know which minion/s you would like. Remember that there is only one of each left, so it's first come first served. *Bart, Ian, Elson, Frank and Howie have already been adopted, do act quickly! Wrapping up the year, crafting with you guys.